The responsibility of offering a clean, safe, and livable rental property to its tenants does fall on the shoulders of the landlord, so does the responsibility of taking good care of the property but the task of providing a safe and habitable residence is a shared commitment that needs to be equally fulfilled by the tenants as well. It is important for the tenants to share and upkeep the responsibilities. Various software for property management is used by the landlords and property owners to make the communication between the landlord and tenants swift and simple. A landlord can uphold their side of the bargain of providing a safe and habitable house to its tenants but they can’t control how tenants live. Its the duty of the tenants to make the proper use of the property and save the house from damage. The tenants need to realize the tasks that are their responsibility to take care of and can not be left for the landlords to manage. Some commonsense tasks, such as proper disposal of trash, need no explanation. While other maintenance issues should be specified in the lease so everyone stays on the same page. Its the responsibility of the owner that the rental property stays pest-free before providing it to the tenants, but once the tenants move into the house it becomes the responsibilities of the tenant to maintain the property well and keep it pest-free. Before moving into the property the tenants should make sure that the landlord or property owners correct the structural problems that put a stop to the rodents and entering of insects. If the owner has already made all the necessary arrangements to keep the pests away then the tenants should avoid attracting them through poor hygiene practices. Tenants will be financially liable for abatement of an infestation caused by poor hygiene and ignorance of the tenants. If specified in the lease agreement then the tenants need to realize that the responsibility of lawn and yard maintenance falls on their shoulder and is not the responsibility of the landlord. In such cases, any violation of city or country decree will be the responsibility of the tenant and not the owner. The tenants will be held responsible for keeping the yard and lawns safe by removing the obstacles and cleaning it up. 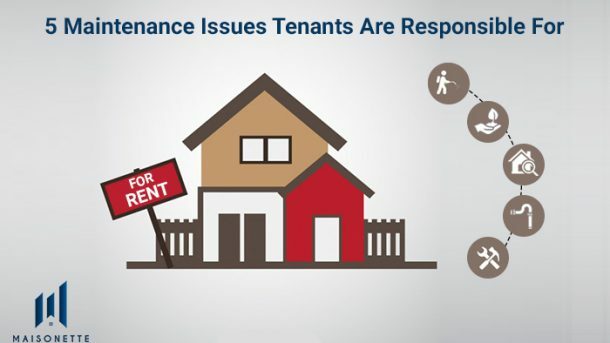 Under special circumstances, such as in shared housing facilities, it depends on the landlord to divide the task among the tenants or contract a tenant for the maintenance task in exchange for compensation. Mold grows with moisture. Hence it can be a tricky question that who should be held responsible for the mold prevention. If the mold forms because of the moisture coming from bad plumbing or the leakage in the building then the mold prevention will be the responsibility of the landlord or property owner. But if the mold is forming because of poor hygienic conditions or practices such as leaving piles of damp clothes in a corner for long, etc. then the tenants will be held responsible for mold prevention. It is the responsibility of the tenants to provide proper ventilation and clean the surface molds if formed on the furniture or on the walls of the bathroom. Improper use of septic systems can seriously impact its life and shorten it. For handling the maintenance issue of the septic systems, most lease agreements contain a separate clause explaining the best practices and things to be avoided, such as greases, treating oils, or non-plumbing wastes. The maintenance of the septic system is usually the responsibility of the landlord but the failure of the septic system caused due to its negligent use by the tenants can be dinged on their name. Most property management software used by the landlords contain a separate section for specifying about the maintenance of the septic system that can be used by both landlord and tenants to notify when the next Maintainance of the septic system is due. The tenants cannot be held responsible for all the repairs required in the rental property and if the landlord demands the same then they can be held legally responsible for it. But it is the responsibility of the tenant to contact the landlord or property manager when the property needs any repairs. Any damage caused due to the failure of such repair works could cost all or part of the security deposit or more, depending on the extent of harm done. Unless it is specified in the lease agreement or permitted by the landlord, the tenants cannot make any repairs in the rental property. Most landlords used the property management software to handle all the tasks associated with the rental property, hence a tenant can easily raise a ticket using the property management software that their landlord is using to get their complaints heard faster. It is crucial for the tenants to read the lease agreement properly before signing on those dotted lines. Once signed the tenants can be held responsible for all the tasks that have been listed as their responsibility in the lease agreement. All the property owners know well how complex the real estate business can be and to accomplish the tasks with ease most suffer by juggling through multiple software for property management. The ERP software by Maisonette Holding helps you automate all business processes for the real estate industry and without making the property management software complex.